By Shaunna Evans 16 Comments · This content may contain affiliate links. The kids really enjoyed exploring different versions of Jack and the Beanstalk. To go along with our reading activities, we made this fun craft and incorporated a little math and science learning along the way. 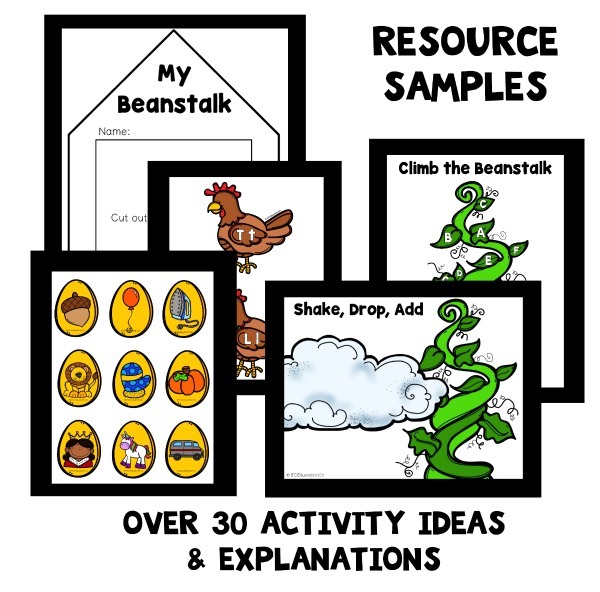 FIND ALL OF OUR JACK AND THE BEANSTALK ACTIVITIES IN OUR PRINTABLE LESSON PLANS. To begin I printed this adorable Jack and the Beanstalk printable set. 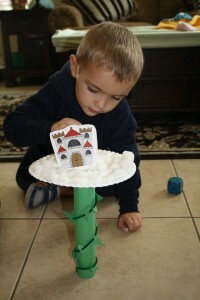 The kids used all of the pieces to retell the stories throughout the week, but we only used the castle for this craft. After I used a white pipe cleaner and tape to secure the castle to a paper plate, the kids glued cotton balls on the plate to represent the clouds in the sky. Then I drew some simple straight lines on a green strip of paper so the kids could easily cut some leaves for our beanstalk. 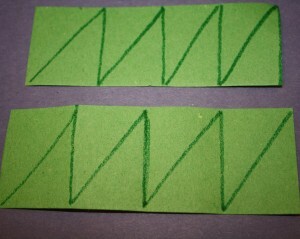 While they worked on cutting, I glued a green piece of paper to an empty paper towel roll. I used a hole punch to put holes in the leaves the kids cut out. Then they added them to a green pipe cleaner. Each child made one, so I twisted them together and looped them around the covered paper towel roll. We had to spread the leaves around a little bit so they didn’t all bunch together. We stapled the ends of the pipe cleaner to secure it. Then we practiced balancing the plate on top of the beanstalk. They quickly noticed that if they didn’t put the paper towel right in the middle of the plate it would fall over. The kids thought it was so neat! And they were learning a lot about balance in the process. 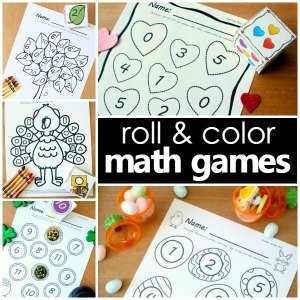 We used this craft for a variety of math activities throughout the week. Comparing More and Less: First we just practiced placing beans (dry lima beans) on the plate without knocking it over. This took a little practice. They had to learn to go slowly and be careful not to bump the plate with their arms. Each time the plate would fall we would gather the beans into a separate pile and set the pile aside. Then we would start over. When the plate tipped over again, we would make another pile and talk about which pile had more beans and which pile had less beans. The kids were excited to see that their piles had more and more beans as they were getting better at learning how to place the beans more carefully. 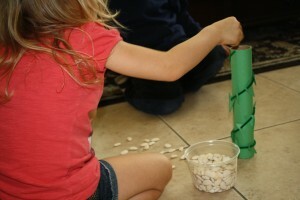 Counting: Once the kids were more comfortable placing beans on the plate, we started to play a game. We would roll a number cube and then place that many beans on the plate. By the end of the week they were getting really good at balancing those beans. Once we even ran out of beans before they tipped the plate! 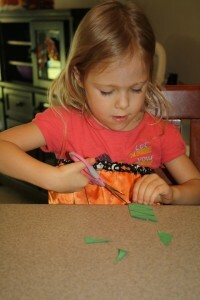 Sound: Don’t you love when kids explore materials in a different way than you envisioned? I always love to see their minds at work. After a while the kids decided to play with only the beanstalk. They started dropping beans, and they were excited to hear the sound the beans made as they hit the tile floor. Then I heard, “What if?” Ooh, how I love to hear those words. It means they are thinking! Soon they decided to put the beanstalk on the carpet, and they were talking about the difference between the sound of the beans falling on the carpet and on the tile. Capacity: And on another day this turned into a way of learning about capacity. 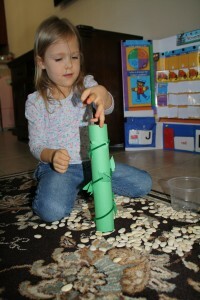 Lovey was trying to see how many beans the beanstalk would hold, and it was a lot more than she anticipated. We started counting one by one, but she lost interest (and so did I) after we got to 180. Then she started adding them by the handful. I think she really just wanted to see if she could fill the whole tube. When she finally did fill the tube, she was surprised to see that there were still some beans left. She picked up the container that the beans were in (you can just barely see it in the picture below), and said, “But this is smaller than this (the tube).” This led to a great discussion about capacity. I tried my best to explain that sometimes containers that are shorter but wider can hold more than taller containers that are more narrow. I am not sure she believed me, but it was a great introduction to the concept. 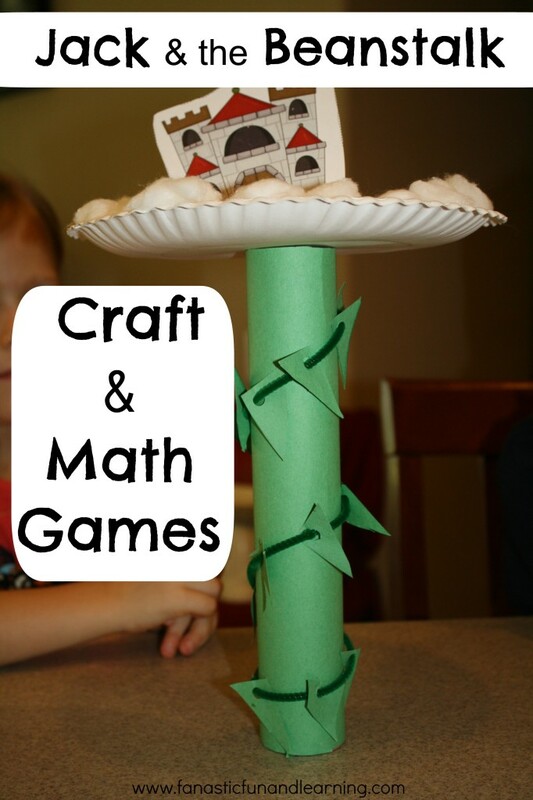 We also used our own Jack and the Beanstalk free printable for more math exploratin. Here’s a quick glimpse. Looking for more ideas? We also extended this book with some alphabet and phonemic awareness activities. Of course, there were more wonderful ideas that we just didn’t get to in our busy week. 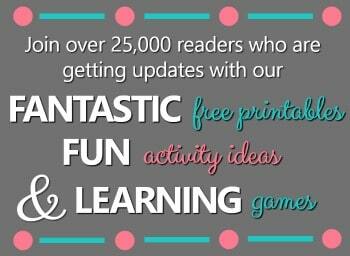 You can find some of those ideas on my Letter J Pinterest Board. 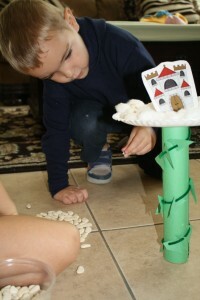 Do you do any math and science activities related to Jack and the Beanstalk? I would love to hear about them. All of our products are also available on Teachers Pay Teachers if you prefer to shop there. We made this today and my kids loved it! Thanks so much for the great idea! I’m so excited that you tried this idea! Thank you so much for taking a moment to stop in and let me know. Glad the kids loved it! I love it! It really looks like Jack’s bean stalk! Thanks! 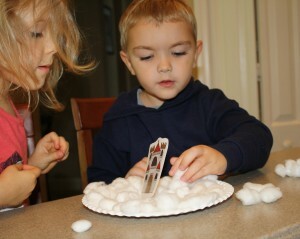 The kids loved making it and playing with it in many different ways. Wow! Thank you for choosing this post. I am excited to share, and I appreciate it so much. This is a wonderful craft and game! I love how you extended this book! Thank you for sharing it on Read.Explore.Learn. I will be sharing it on the Facebook page in the morning. Thanks so much! We had a lot of fun with this story. I really appreciate you sharing the post. These are some wonderful ideas! Thanks so much for linking to Mom’s Library! Thank you for checking them out, and thanks for co-hosting! What a fun learning activity! 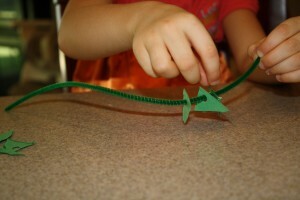 Love the threading onto pipecleaners and how you all made the beanstalk…so creative! I bet they kept busy for ages with this one!